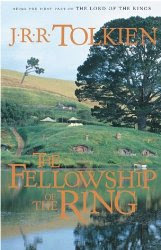 Just like the rest of The Lord of the Rings series, I can't say much more than what has already been said before about the books. I can say that it has been a long time since I had read the entire series, and I am really enjoying reacquainting myself with the characters and their world. I find it interesting, having recently rewatched the movies, to see how events were rearranged and changed to fit the film version. This is one of those books that I think everyone should read at least once. You really can't appreciate the epic scale of the story until you've experienced it for yourself. What a coincidence that we should both post of The Lord of the Rings on the same day. Or is it! I have to say that as I sat having tea at Ted Sandyman's Mill yesterday I did think you would have been exactly the right person to have for company. you would have understood the magic of the experience exactly.